We parked at the site of the Cheltenham Brickyards. It was 22 degrees and sunny, a beautiful Saturday morning. It was time for us to investigate the brickyards as well as the community of Cheltenham, which will form a companion post. The brickyards are fenced off so it’s handy to have a camera where the lense can fit through chain link fencing. Cheltenham is situated on the Niagara Escarpment and the surrounding area has plenty of easily accessible shale deposits. In the early 1900’s it was discovered that this shale made especially good dry pressed bricks. Frederick Bruce McFarren was born Oct. 25, 1889 in Toronto and would become one of the best known figures in the Canadian clay brick industry. 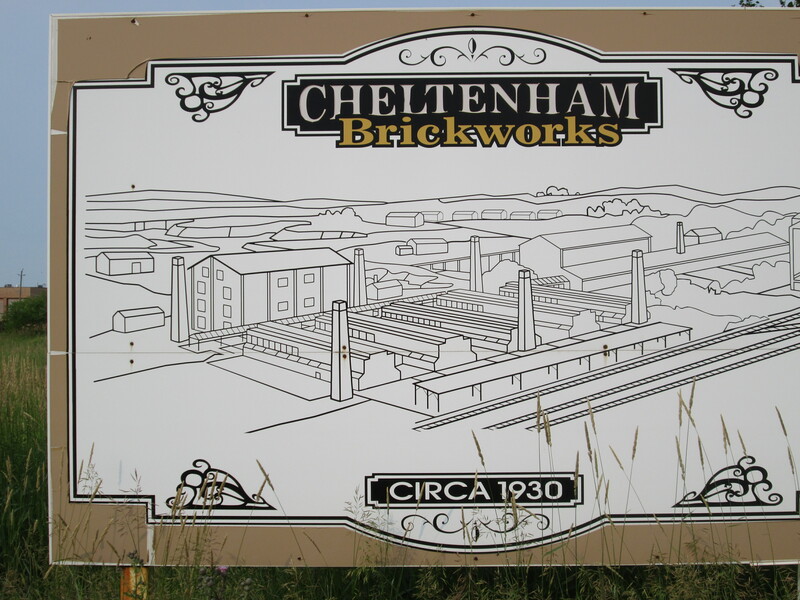 In 1914 he produced his first bricks in the Cheltenham Brickyards under the name of Interprovincial Bricks. 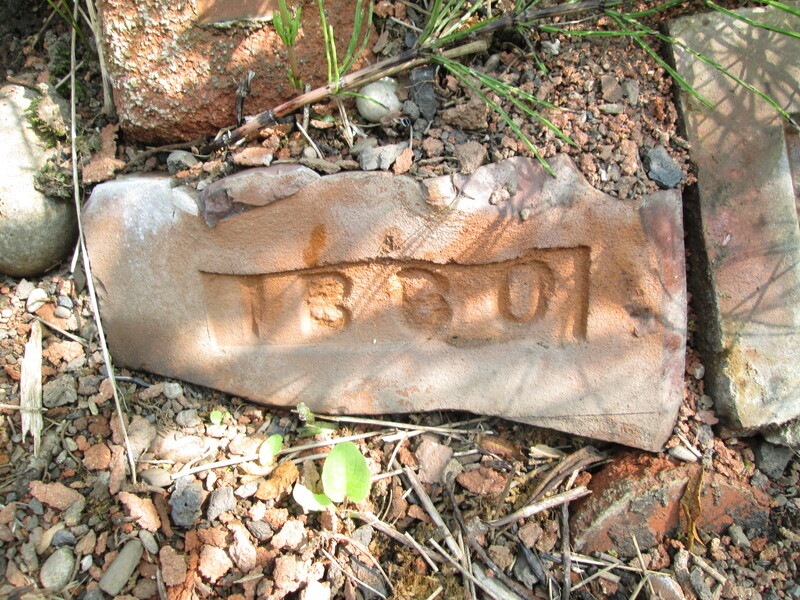 The brick in the picture below is marked “I B 8 0” for Interprovincial Bricks. Like other less than perfect examples, it has been discarded along the sides of the old railway tracks. The Brickworks was sold by McFarren to Cooksville Brick in 1928 but Frederick retained a management position there until at least 1955. McFarren was responsible that year to oversee the conversion of the plant from coal fire to natural gas. 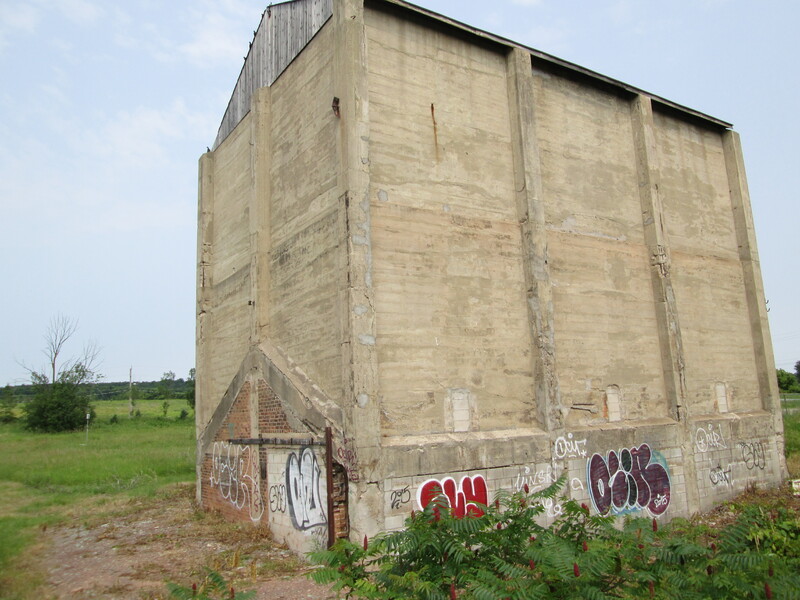 The building closest to Mississauga Road is the concrete coal storage shed. Built of poured concrete with concrete buttresses it was used to store the coal that fed the kilns until 1955. Two, three story brick buildings remain on site. These were known as crushing or mixing sheds and stood just to the north of the kilns and chimneys. The two buildings feature brick buttresses and overhanging gable roofs. 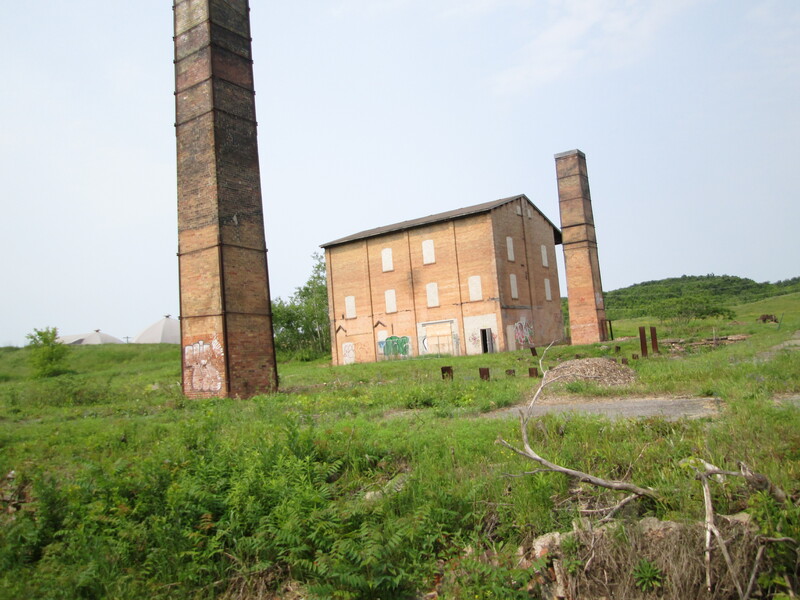 The cover photo shows all five remaining kiln chimneys along with one of the crushing sheds. Also seen in the picture below are concrete bases for brick storage sheds and steel beam supports for manufacturing buildings. 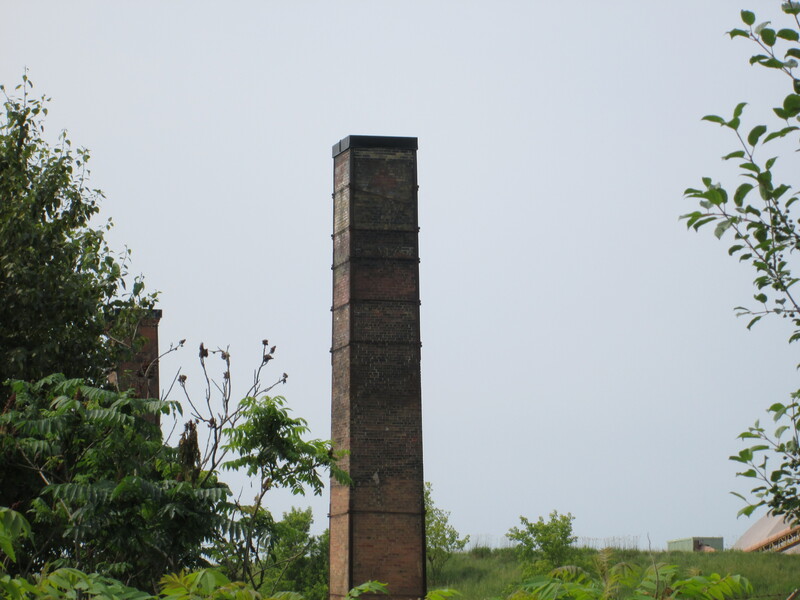 Five of the original six brick chimneys are still standing. These four sided chimneys are built of bricks and reinforced with metal banding. Originally they were set in pairs but the south eastern one is missing today. Long buildings containing kilns ran between the chimneys. The chimneys were used to exhaust the underground ventilation tunnels from the downdraft kilns. The tunnels and some underground works still remain. Intercontinental Brick introduced the first continuous or “railway” tunnel type of kiln in Canada in 1922. The kilns at Intercontinental Brick were built by G. W. Booth. Two manufacturing plants existed on the site and although they have been removed the brick walled earthworks still remain. The Hamilton & North Western Railway was incorporated in 1872. In 1888 they were absorbed into the Grand Trunk Railway. The GTR was taken over by the Canadian National Railway in 1923. Mcfarren chose the site of his brick factory carefully. He needed a place where the raw materials for his bricks could be extracted on site so that he wouldn’t need to pay to transport it. He also needed easy access to shipping, preferably by rail. In 1912 a site was selected near the GTR tracks, close to Cheltenham for labour and with easy access to the local shale. The picture below shows the now abandoned railway tracks and the berm on the right that hides the still active shale pit. Another local innovation was the bringing of electrical power from Georgetown to power the plant. Interprovincial Bricks was sold to E. P. Taylor in 1954 and to Domtar in 1955. It was under Domtar ownership that the brickyards were finally closed in 1964. Meanwhile McFarren had purchased Streetsville Brick with the money he made from the original sale in 1928, renaming it McFarren Brick in 1929. McFarren is remembered in Streetsville with a park named after him. 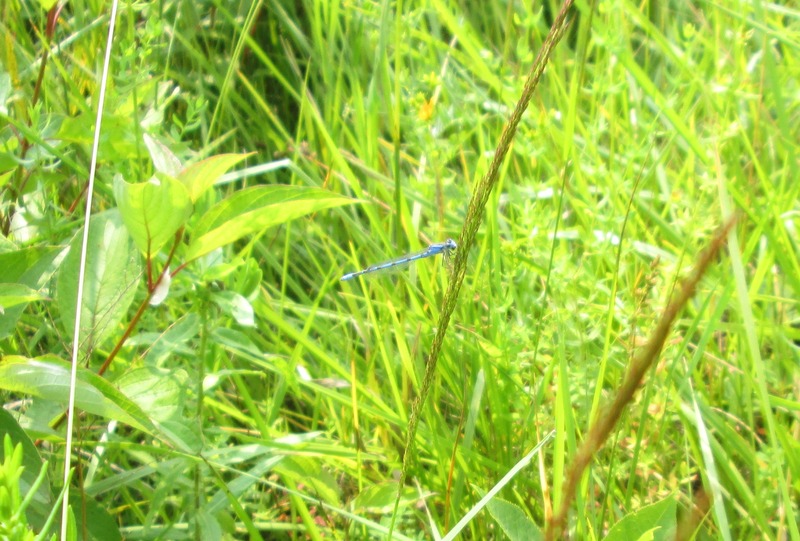 The Familiar Bluet is a damselfly, sitting with wings folded, and is common in Southern Ontario. They were darting all around us and one is hiding on the stalk of grass in the centre of this photograph. The picture below shows what the brickyards may have looked like around 1930. Several additional buildings can be seen, some of which were workers housing. Notice the kilns running between the six chimneys. Eyed Brown butterflies seemed to be everywhere along the sides of the old railway line. As weather patterns change this butterfly is becoming more common in northern areas. 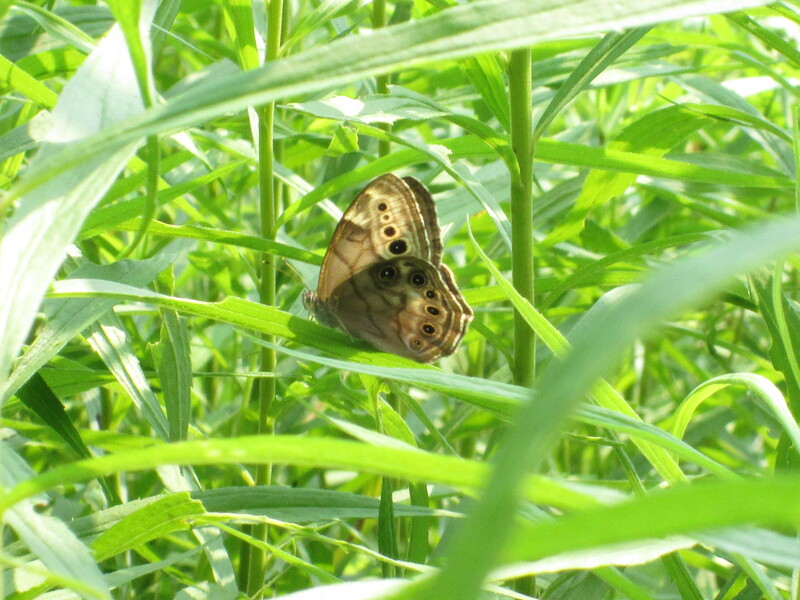 The less common Smoky Eyed Brown has 5 spots on the forewing instead of just four as on the example in the picture below. 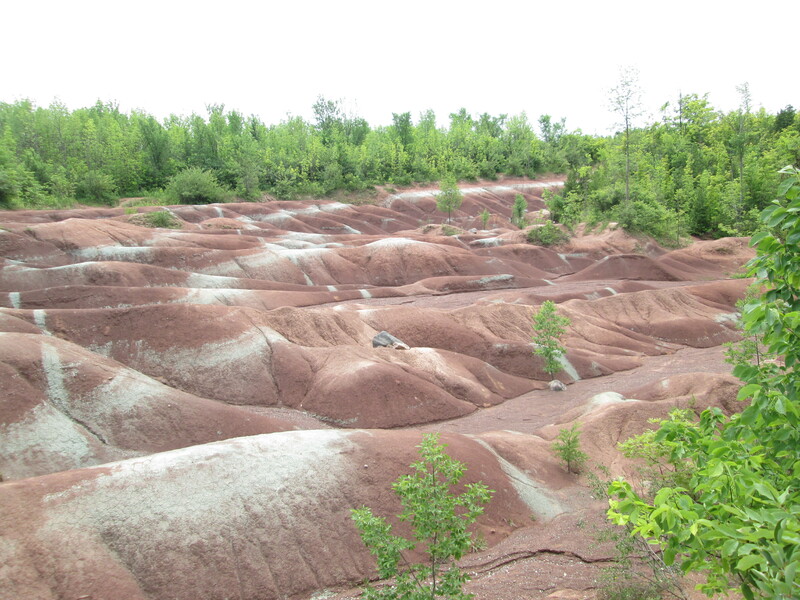 Just north of Cheltenham are the Cheltenham Badlands. The area of the Great Lakes was formerly an inland sea known as the Michigan Basin where over time a delta was formed of iron rich soil. This mud was slowly compressed into what is now known as Queenston shale. The iron in the shale gives it its red colour. This shale was exposed when cattle grazing removed the protective vegetation cover. Farming has been discontinued at this site since 1931 but the erosion is ongoing. The clay seen here is similar to that found at the site of the Cheltenham Brickyards. A hiking trail used to cross the badlands but people won’t stay on the trails and the erosion is increasing. Therefore, the area has recently been fenced off while a new preservation plan is developed. 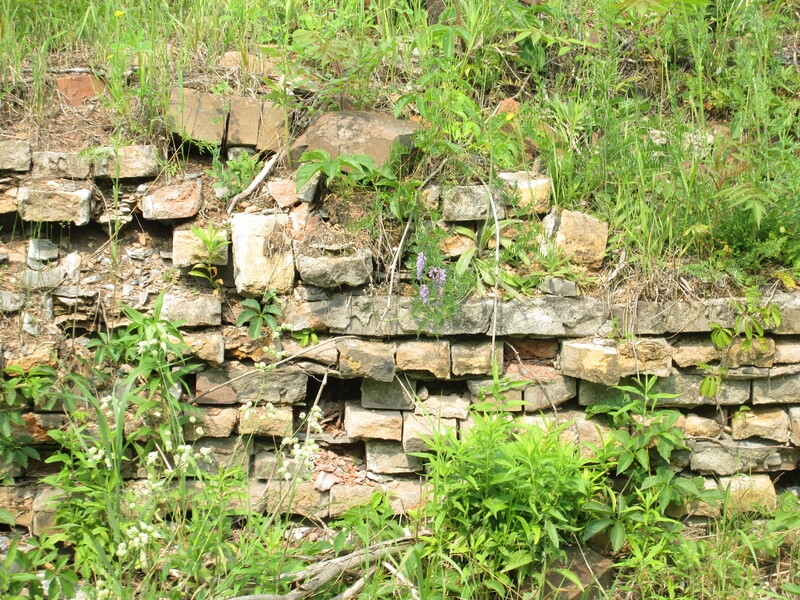 The Cheltenham Brickyards have a cultural heritage designation because they reveal an important use of the local landscape. Proximity to raw resources and transportation allowed the nearby community to continue to prosper after the decline of the saw mill and grist mill industries. Look for more on the founding of Cheltenham in an upcoming post. 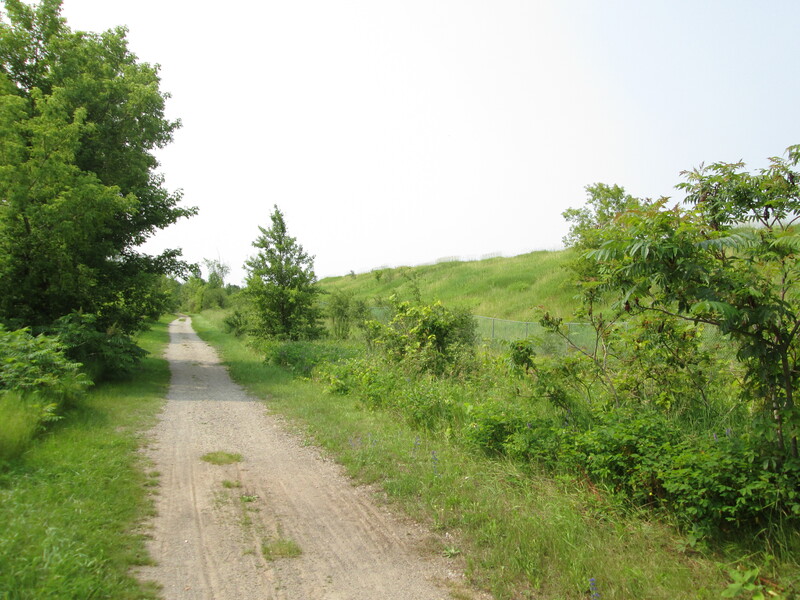 This entry was posted in Credit River and tagged Brickyard, Cheltenham, Cheltenham Badlands, Cheltenham Brickyards, Intercontinental Bricks on July 6, 2015 by hikingthegta.